One of the most important and earliest decisions you will make as a self-publisher is to choose the name of your self-publishing imprint, or publishing company. In this article I’ll explain why you want to make this decision early, why a name other than your own is advisable, and the resources for researching the availability of a name. What is a self-publishing imprint? A publishing imprint is the name of your publishing company—the name displayed to the public wherever you sell your book and in distribution channels. It is also listed on your book’s copyright page, and the name assigned to your ISBN. Self-publishers can use their author name but it is preferable to create a distinction between the author name and the publisher for public relations and brand-building reasons. It can be an invented name, the name of one’s existing business, or some variation. The first question that usually follows this is, do I need to set up a formal business entity under this name? The short answer is that there is no requirement, but depending on your circumstances, it might make sense. One consideration is whether you want to accept payment in the name of your imprint. In many parts (all?) of the country a bank will want to see proof that you are authorized to be “doing business as” (DBA) this name and you will need to formally register the fictitious name. Check with your city, county or state. There are many considerations so I’ll leave further discussion to a separate post. You should also contact your tax or legal adviser about your individual circumstances. Why do you want to make this decision early? Marketing a book before its release date—sending out advance reader copies (ARCs)—is one of the most effective marketing activities you can do. You will naturally be promoting your ARCs and doing pre-publication PR using the name of your imprint. Another reason to consider selecting your name early is that it is an important metadata element. Depending on the words it may help your book show up in search results—on Google as well as Amazon. Where is your self-publishing imprint name used? One of our distribution management clients learned about this the hard way. Eager to get started, and before he had a plan, he bought his ISBNs. The problem is that he used his name, not knowing that this would be the name of his imprint. Fortunately, we were able to get this corrected because the book was still in production. This is another example of why you want to make this decision early. Library of Congress filing. Besides the imprint name, you need your publisher identifier from your ISBN series to start the process (chapter 5 in Register Your Book). The name you enter must be the same as the one you entered as publisher when you bought the ISBN. Copyright filing (chapter 4 in Register Your Book). Distribution accounts. This is especially relevant if you plan to enable pre-release ordering for your book. Book sales page. This displays automatically for books available via pre-order (e.g. Amazon Advantage or KDP). Why choose a name other than your own? As noted above, a name other than your own helps create (and maintain) a public record separate from you as the author. As many of us know, there continues to be a bias by many in the media, book retailers, and readers against self-published books. A unique name, with no ties to your own, could help your marketing efforts. It certainly won’t hinder them like the use of your own name would. Now, there are some who feel this is disingenuous or deceitful. Ignore them! You are no different than any other small business wishing for a life of self-determination. It is the American dream to own one’s business and for that matter, I think it helps us authors maintain a healthy distinction between us as writers, and us as business owners. It may also be helpful in establishing the legitimacy of your business when it comes to filing taxes. Are you a hobbyist, or a business? Waterhouse Press: Imprint for romance writer Meredith Wild. Wild has taken it to the next level by publishing books for other authors. Hyde Street Press: Imprint for Barbara Freethy. Freethy is notable because she signed a distribution agreement with Ingram Publishing Services. Broad Reach Publishing: Imprint for Huge Howie, author of the blockbuster novel Wool. Howie is notable because he was able to negotiate a distribution arrangement with Simon & Schuster for his print book edition of Wool . His imprint remains the publisher of his eBooks. The more unique, the better. Modify a term to make it yours (but not a trademarked term). Be mindful of word choice (e.g. plurals). Here’s a good test. Imagine you called your mom to tell her the name of your new publishing imprint. How many times did you have to say it, or even spell it, before she understood? Not many people know this but the publisher name is listed in Amazon’s search engine, even if you have one book. So, one of the best places to find out if someone is already using your imprint name is to type it into Amazon. Depending on how unique it is, you may see just a couple books, or pages of books, or no books. Open each one and look at the book’s information. I put GoDaddy second on the list because I feel it is important to also own the domain name for one’s imprint. True, the domain does not have to match the name exactly, nor do you need a publishing imprint website, but it is especially nice to have it if at all possible. Dot com’s are always the first choice but other extensions may also work. Try a few combinations and then come back to buy it after you finalize your name. Do not wait to do this. Searching your county’s records database is of vital importance if you plan to file what’s called a fictitious name filing, or D/B/A—“doing business as”. Your county may differ but in my county, San Diego, I can search online and then visit a local office to file the necessary forms to begin the process. Each state maintains a database of fictitious names in use by registered corporations, limited liability companies, etc. You may not be interested in going this far to establish your publishing company due to the higher fees and added paperwork, but for our purposes it is a rich source of names to help you avoid choosing an already-in-use name. Search online for your state’s database, in California it is located here. Even if you do not plan to file for trademark protection, the U.S. registered trademark database at the U.S. Patent and Trademark Office (USPTO) is a good resource. Your state’s trademark database is also a good resource. This is a comprehensive directory of the American book publishing industry with listings for more than 2,000 big and small publishers. You can register for free and do a name search. Click for information. I imagine this is the first place most people search. Be sure to also check other search engines such as Bing.com. Enter your term with and without spaces, put quotes around the term (to find an exact match), and go beyond the first few pages of results. Finally, if you have more money than time you can hire someone that specializes in this kind of research. Once complete, they can file all the forms on your behalf. Does this sound time consuming, and involved? Perhaps. However, once chosen a self-publishing imprint name is essentially forever. It's a name that represents us and is the brand behind our books. As my woodshop teacher used to say, measure twice, cut once. 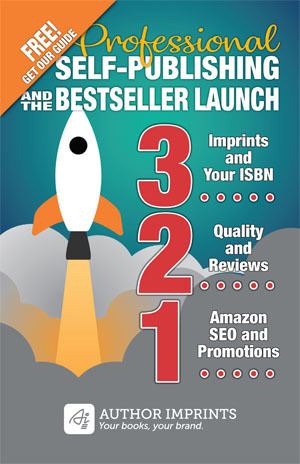 Do you need help establishing a self-publishing imprint? Our specialty is helping authors and businesses establish their self-publishing imprint brand, and producing and distributing their books. It is a white-glove, full-service solution that protects your brand and less expensive than working with a subsidy press. Authors can click to learn more here. Businesses click here. So, basically, all I’d have to do is come up with a unique name that is not used and use it for IngramSparks? No registering or paying required? Yes, unique and that is more of a legal matter. People like Bowker and IngramSpark don’t cross reference or monitor this. Doing a web search is the place most people start when checking on a business name. While a general search can let you know if there are other similar business names, there are some more detailed searches you should also perform.